A trusted name in professional and home printing, Epson printer cartridges deliver superb quality prints for documents and photographs and provide affordable ink solutions for a wide range of printing needs. 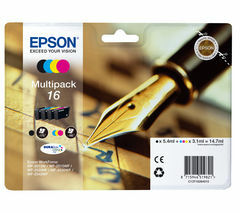 Whether it’s occasional home printing, detailed colour photo printing or high-volume office work, our Epson cartridges and multipacks help you get the job done. For impressive photo prints and high-quality text documents, Epson printer cartridges are affordable, reliable and the only way to get the best results from the Epson printer range. Compatible with Epson’s full range of printers, for home and business use, our cartridges are designed to get superior printing results from Epson’s WF, XP, EcoTank, Stylus, Stylus Photo and Stylus Office printers. Incorporating the latest innovations in ink and printing development, these cartridges make printing easier and cheaper, while achieving truly professional results. 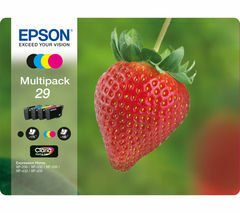 For everyday printing and high-volume jobs, Epson multipacks and XL ink cartridges help you save. Providing better value than single cartridges, they’re a great option for businesses and those that do a lot of printing. Epson’s EcoTank range can deliver up to 7,500 prints per refill, so you can go longer before it’s time to top up or replace. Epson’s Advance DURABrite Ultra inks boast brighter, longer-lasting colours, and a quick-drying ink formula that’s instantly waterproof and smudgeproof. If you like to print your own photos, its Claria Premium Ink delivers photo lab-level glossy photos and crisp, clear text documents too. Whatever your printing projects and workload, our Epson print cartridge range is designed to help you save while giving you the fantastic print quality you want. Take a look at our full range of printers and scanners to see what Epson can do.